Центрально-навесные дисковые косилки с гидравлической подвеской. Данные модели навесных косилок с рабочей шириной 3.20, 3.60 и 4.00 м, укомплектованы полностью сварным тонким брусом для улучшения качества резки. Косилки Kverneland 2540 MH – это косилки высокой производительности с рабочей шириной 4.00 м и 10-ю круглыми дисками. Они сочетают в себе лучшее из подвесного центра серии 2500 MH и новую систему HydroFloat - гидравлическая подвеска для обеспечения более равномерного хода широкого 4-х метрового режущего модуля. 2532 MH 3.18м 8 794 кг 40/55 кВт/л.с. 2536 MH 3.57м 9 925 кг 47/65 кВт/л.с. * Обратите внимание на минимально требуемый вес трактора. The centre pivot suspension provides an even weight distribution of the 2500 H, 2836 M, 3224 MT, 3228 MT and 3132 MT and a uniform ground pressure over the complete working width, ensuring good ground contour following. The mowing units are suspended in the centre of gravity. This design provides a constant, faster and more precise adaptation to ground contours. The benefit is less skid wear, optimum protection of the stubble and less fuel consupmtion. The 2500 H disc cutterbar features a direct drive from the gearbox to the first disc that efficiently reduces power wastage and takes full advantage of the whole working width of the cutterbar. To offer maximum protection of the cutterbar, these machines are fitted with the well-known Kverneland BreakBack solution. The 2500 H and 3132 MT are designed with a hydraulic suspension system, allowing easy setting of ground pressure, to adapt to varying field conditions. This provides the best conditions, for an even cutting height and maximum protection of the stubble. 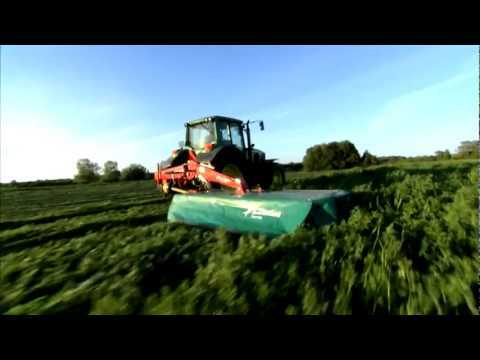 The result is better forage quality, less wear on the mower and reduced fuel consumption. The ground pressure can be continuously and quickly adjusted from the tractor seat, even while operating. All you need to do, is to activate the hydraulic outlet. On headlands the mower is lifted without activating the three-point linkage of the tractor which needs no adjustment in the field. A clever and simple solution ensuring good clearance and eliminating swath damage.